Jeremy the plane flies into Sodor airport to visit Thomas, who is busy pulling the the Troublesome Trucks full of cargo! They can have fun racing each other as Jeremy takes off and flies circles aroud Thomas! You can switch the points to change Jeremy's flight path and send him in the opposite direction! 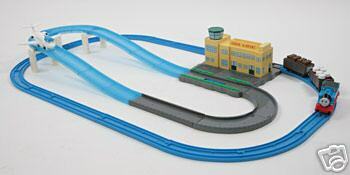 Comes with separate ovals of track for Thomas and Jeremy and an airport terminal building.